The expertise of Eclectic Art & Objects Gallery's Restoration/Conservation Arts Studio is put to practice the moment we are presented with a painting in need of repair...The first step is to identify the cause of the damage and through careful analysis, determine the proper treatment and specific materials required to bring the painting back to its original line, color, texture, and brush. 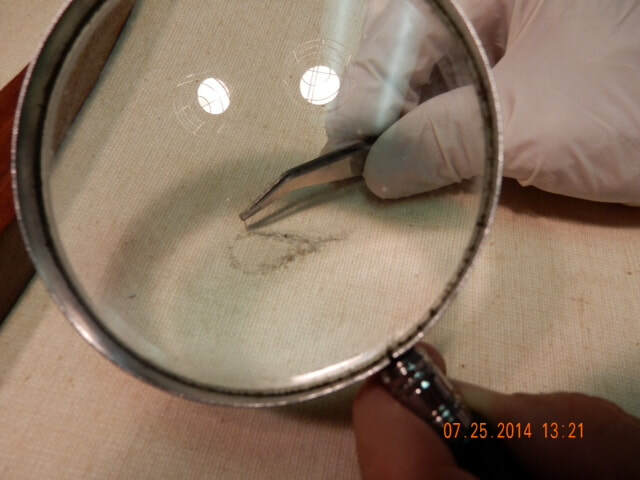 The proper emulsion cleaning formulation will assure a clean surface without paint loss. 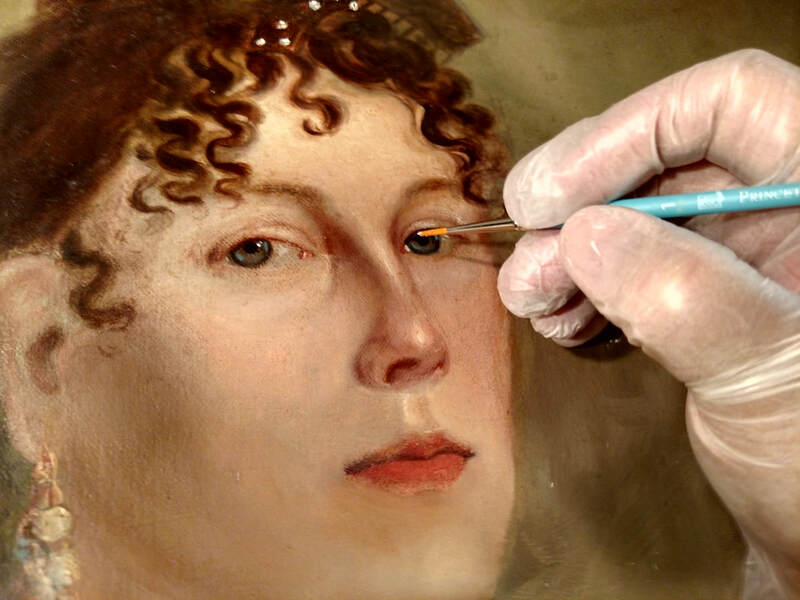 ​Matching color, brush strokes, special effects and missing painted detail, is perhaps the most important part of the restoration process and requires the eye of an experienced artist to identify and painstakingly recreate the original color palette that the artist likely used when executing the original work. 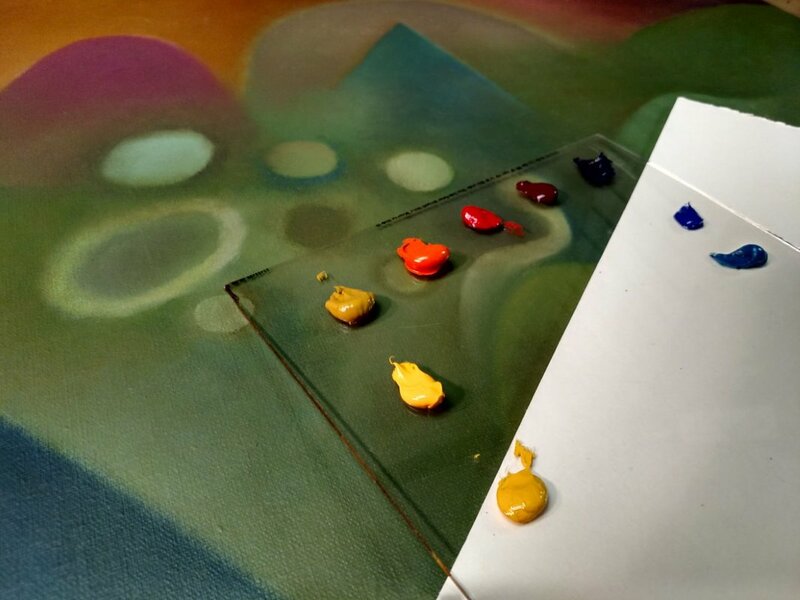 Oil paint is rarely applied to a composition in a raw, solid color. As a matter of fact, it is part of the painters dance to mix and borrow color from around the palette in order to unify the painting with hints of borrowed color that are generally not consciously perceived by the naked eye. It is the very magic and life that is inherent in great works of art. 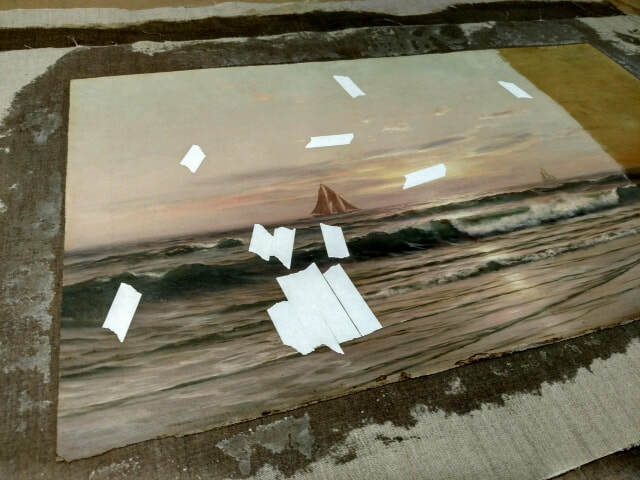 After over twenty years of restoring old oil paintings, the restoration team at Eclectic Art & Objects Gallery has cleaned and restored over a thousand oil paintings in various stages of disrepair due to what I call the "art enemies" that include: dirt/smoke, water/moisture, sun/UV exposure, dry rot, cold/freezing, physical trauma/tears, and worst of all the destructive practices of past restoration/conservation efforts. 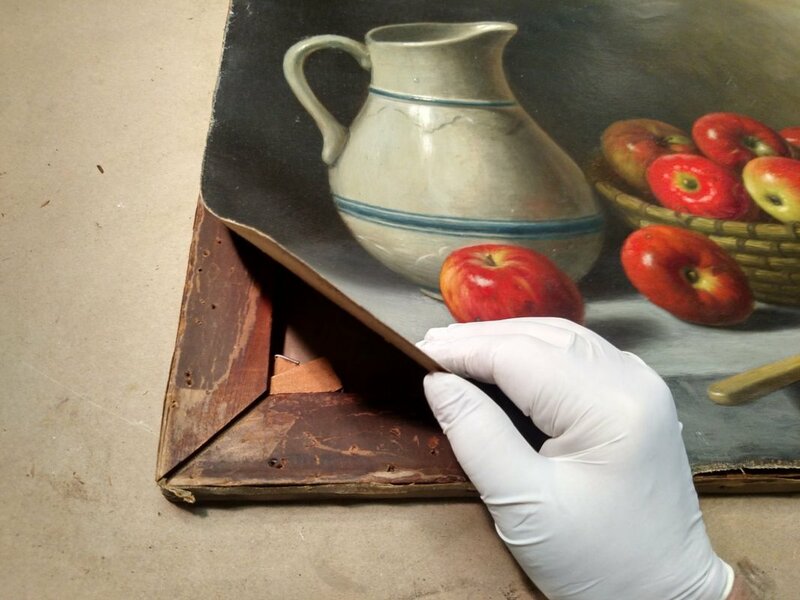 Over fifty percent of the paintings that we restore back to their original intended condition were initially improperly restored...most often within the past decade. 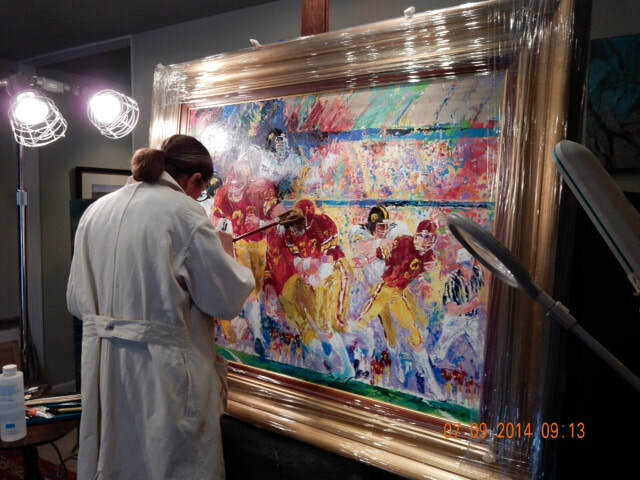 Artistic Talent is the main driver to assuring that a damaged painting with missing paint, tears, holes, and/or professional malpractice through poor color match and a failure to faithfully reproduce the brush, palette and spirit of the original artist's style. ​In one case, the artist used feathers, toothbrushes, an old torn license plate and other found objects to accomplish his intended effects. But when the painting came in to ourrepair a large tear it was necessary to research the artist's technique, rediscover the tools that were used to execute the original effect and practice until the repair was indistinguishable from the undamaged portions of the composition. 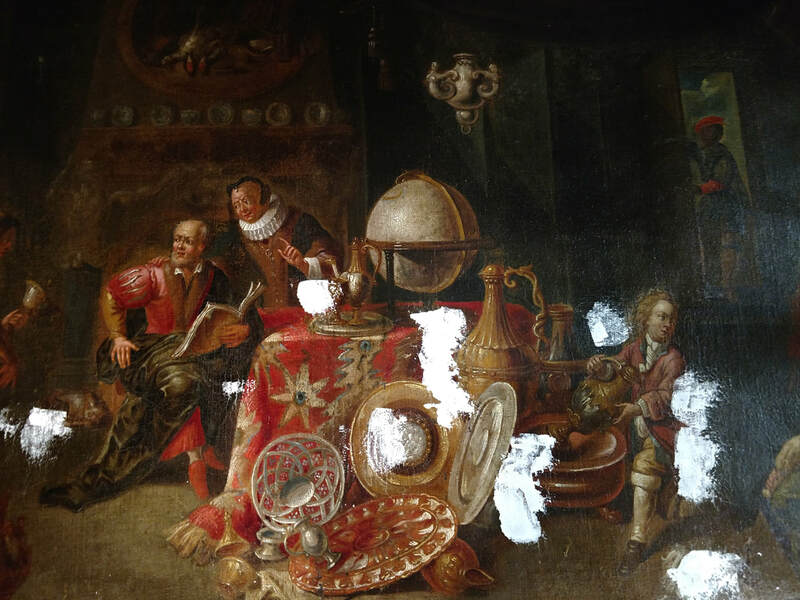 Todays conservators have dissected the process of cleaning paintings via nano technology that relies on electron microscopes, and dead animals to perform impact testing on various emulsions and cleaning agents and their effects on the environment and the safety of restoration /conservation technologists. Over the years I have seen a wide gamut of seat of the pants short cuts, and outright malpractice in lining/relining techniques.. and the repair of holes and tears in canvas supports are among the worst...i.e. Tire patches, toothpaste, band aides, duct tape, plaster, and gorilla glue are just a few of the "quick and dirty techniques employed to mend canvas tears/holes...sagging canvas, etc. "I have been using the conservation and restoration services, provided by Eclectic Art & Objects Gallery, for approximately 15 years. I normally do not provide client testimonials, but wanted to make sure my opinion gets posted on Eclectic Art & Objects Gallery's website. Bob and Sheila Keller (owners of Eclectic Art & Objects Gallery) have restored many pieces of fine art for me, including oil on canvas, oil on board, pastel, watercolor, frame repairs, etc. In all the years I have worked with Bob and Sheila, they have always been professional and strive for the same perfection that I seek for my 19th century fine art collection. Their work has been impeccable and shows that experience matters. They have been doing this type of work for many years, before I knew of them, and, in my opinion, are the best at what they do". "Bob Keller, restorer extraordinaire has cleaned ,relined and just generally repaired a large number of oils and other media on canvas, board and panel for me over the past 5 +years. 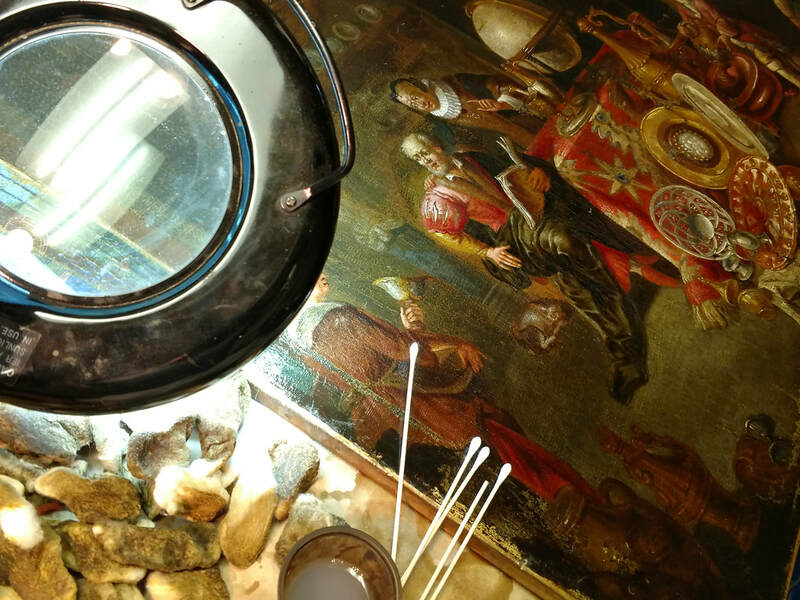 He does an amazing job fixing frames as well as patching and gilding and making some badly mistreated paintings look like they historically did. He has also done some incredible efforts on works on paper .The best parts of his endeavors are that the paintings are so vastly improved It is nearly impossible to see any trace of his extraordinary talents. I would recommend him without hesitation". 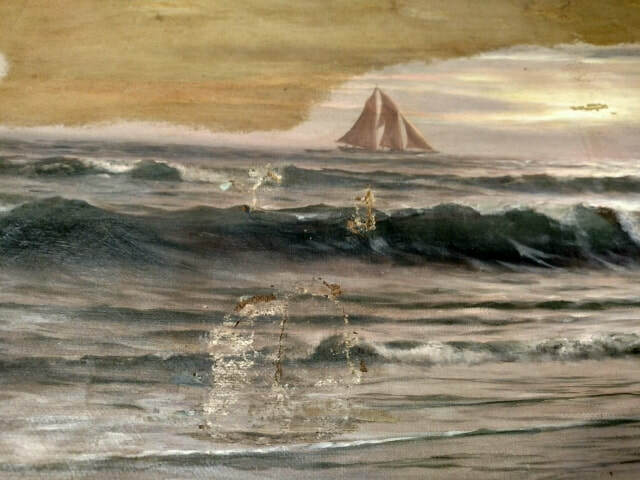 ​of 19th Century American art and oil paintings of our time. "I would like to express to you our sincere gratitude for the beautiful restoration work that you did on the icon of St. Demetrios..
with not only expertise but with a certain amount of reverence and respect, since the icon is much more than a work of art in our Faith. I could not believe my eyes. I was more than satisfied. The result was amazing and beautiful...Truly, a miracle had taken place!" permanently installed ​in the church entrance as a tribute to the rescued icon of St. Demetrios. 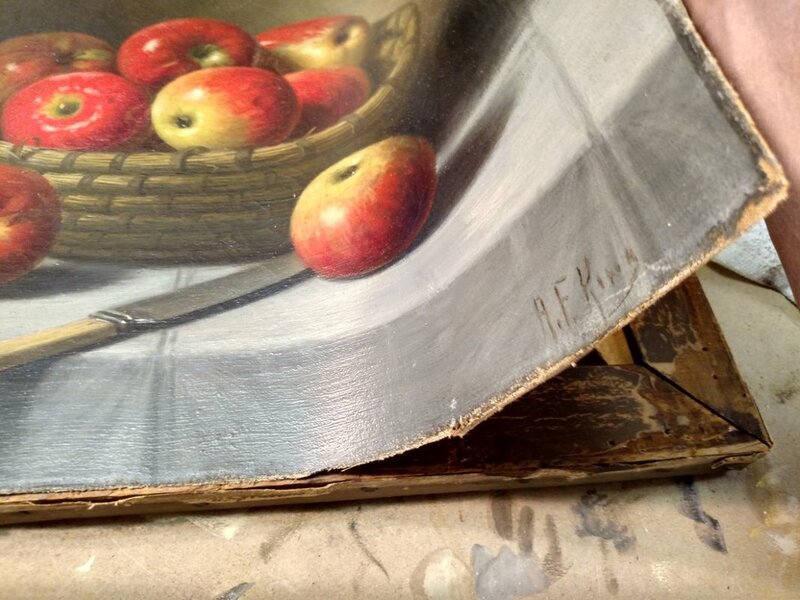 for a complimentary evaluation of your old and/or damaged oil paintings. ​No deposit is necessary if you choose to leave the painting in our care.